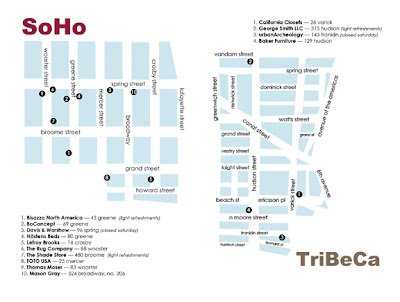 ASID NY metro chapter cordially invites you to attend the SOHO/Tribeca Design Walk. New York’s favorite showrooms will be offering exclusive events October 2-3, 2009. Event hours will be 12pm to 6pm each day. This year’s event supports a very important member of our community; A.C.E. - the Association of Community Employment programs for the homeless. Each showroom has donated items that will be awarded through a silent auction at the closing event on Saturday evening (6pm-9pm). Come join your industry professionals to learn about new trends and products, great networking, food and fun. Make sure you stop by the following showrooms for events, lectures, parties and an ongoing silent auction over the course of the two-day event.